Turning cars into other cars is not such a strange concept. That’s basically the entire point of “replicas,” and there will always be those who attempt to convince others that a replica is the real thing. But they shouldn’t be confused with those who playfully create miniature versions, like this Blue Demon Datsun Z made from a Subaru 360. 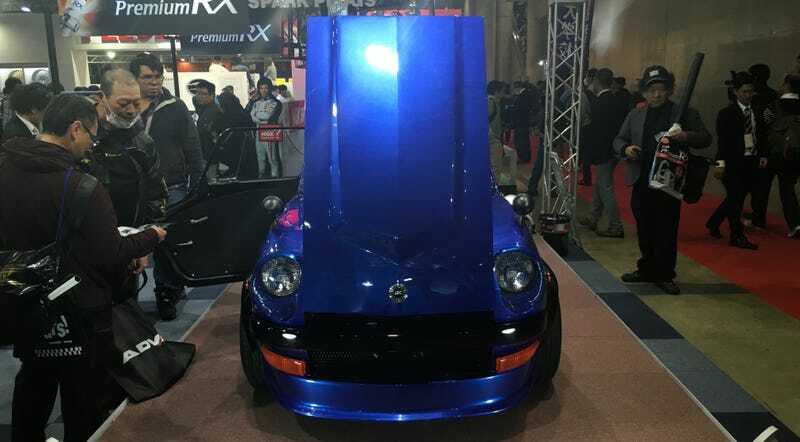 The mini Blue Demon Z is meant to mimic as closely as possible, in miniature proportions, the original Blue Demon Z from the anime Wangan Midnight. The show is a lot like Initial D, although it takes place on the tollways of Tokyo (like Fast and Furious: Tokyo Drift) rather than the mountains of Gunma. The Datsun Z is called the “Blue Demon” because the car has a mind and soul of its own. It influences reality in order to accrue a list of drivers with the same name (not as rare in Japan as it might be elsewhere), and kills those it finds unworthy. The electric mini version? Not likely to be making any tollway races anytime soon. Not only does it have a mere 45HP, but the 360 isn’t exactly made of the strongest materials and a gentle breeze could probably knock it over. Built by the students of the Saitama Institute of Automotive Technology, it is the latest in a line of project cars shown at the Tokyo Auto Salon over the years. The SAIT, or Saijidai in Japanese, is a Senmon Gakkou, which is like a cross between a vocational college and a technical high school. The students graduate with something along the lines of an associates degree in automative technology, and clearly, they’ve got some chops. Next year? I want to see a tiny AE86 Trueno made out of an original Rover Mini. What about you?